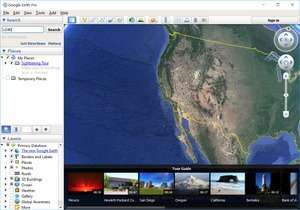 Google Earth Pro, formerly a commercial application that cost a number of dollars, is now available as a standalone freeware application. With Google Earth Pro, all users are now allowed to access high-quality and high-resolution aerial photography and ground images through Google's award-winning Earth program. The application provides a number of tools including zooming in and out, tilting, panning and different ways to access images and data. You can also check out the flight simulator tool included within. Version 7.3.2.5776 is a freeware program which does not have restrictions and it's free so it doesn't cost anything. For security reasons, you should also check out the Google Earth Pro download at LO4D.com which includes virus and malware tests. Additional screenshots of this application download may be available, too.